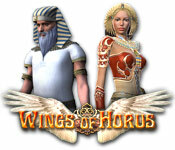 Wings of Horus is rated 2.0 out of 5 by 24. Rated 5 out of 5 by sjlm53 from Wonderful Match-3 Game! This is a fun match-3 game to play! The music and sound effects are good and appropriate for the setting of this game. I am very pleased that it has an un-timed mode. This game is good for all skill levels from beginners to experts that love match-3 games! Also the story-line is excellent! Rated 5 out of 5 by betskand62 from Match 3 and more This is a match 3 game with some interesting variations. You must eliminate a villain who creates problems; then obstacles appear which must be destroyed with bombs (earned by making long matches) or powers that you accumulate. The final series of games are fairly hard and require planning. I had only 2 complaints: the primary sound effect has a metallic quality that I find annoying, but I am sensitive to certain frequencies. No one else around me seems to mind it and I just turn the sound down. The other is that the Egyption princess heroine looks a little too much like a modern superheroine. But the art backgrounds are wonderful and very detailed. I have gone through this game several times and will again. Rated 4 out of 5 by SandieSue from Not Super Easy I love match 3 games and this is no exception. I can usually get past 10 levels before I fail a level, but with the enemy continually adding block I need to clear, it was more of a challenge. I had to redo level 5 or 6 four times to defeat the enemy and complete within the time limit. Graphic were OK. Rated 4 out of 5 by CAHbKA from Not bad! Game is simple in graphics and it's gameplay could be faster. But it's okay game.I also loved game intro! Rated 4 out of 5 by ecblisa from A very fun game if you keep playing I am writing this review after playing all but the last 9 levels (of 60). By now, the game is actually quite complex and not that easy. On each level, you first have to "defeat" an enemy by making matches of two designated colors. The enemy adds tiles to your board every few seconds -- this is timed, even in Zen mode -- and it is possible to run out of moves, or at least not be able to see any, and get into a situation where the board gets more tiles, more rocks, and more locked tokens wile you struggle to do anything at all. My solution: go to options, return to menu, and restart the level; it will likely work better the next time. 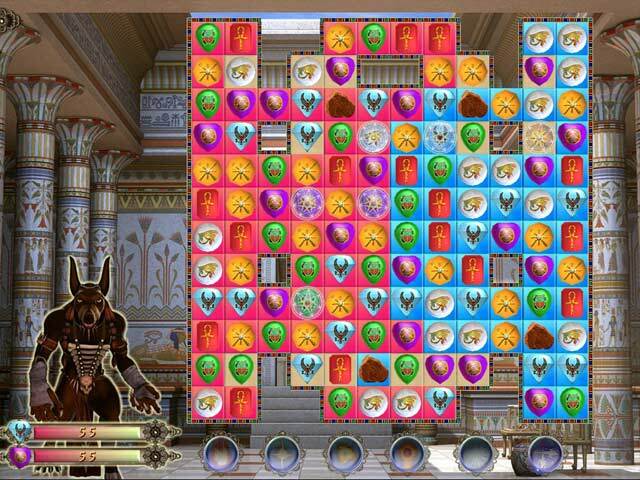 With each level, the number of tiles of each color you need to get rid of the enemy rises. Once the enemy is gone, it's just you against the board. Every few levels you get a new power-up, and these are pretty good. They are activated by tiles of a particular color each, and the tiles you delete with a power-up count both to defeat the enemy and to fill the power-up meters. By the higher levels, the rocks and locked tokens are a real obstacle to progress, especially in tight situations. 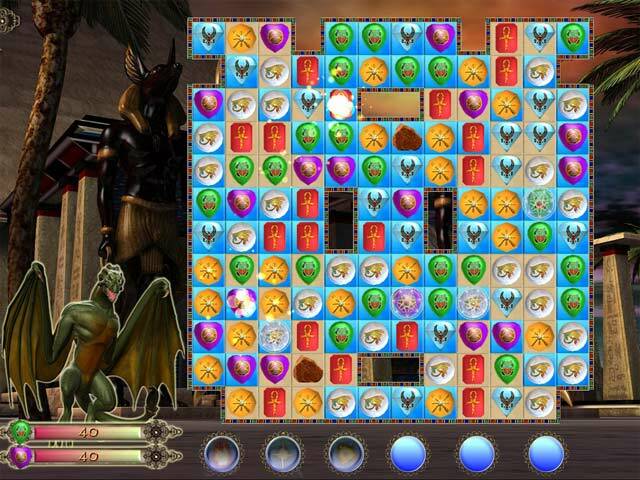 There are also spaces where tokens cannot be matched because of the shape of the board, and it is good to note those early and use a power-up to clear them. Aside from the "big" power-ups, there is also an explosive token that clears 3x3 tokens, one layer of tile, rocks, and locks. You get it by making 5 matches in close succession. So when you're really stuck and have to search arund for moves, you won't get these. Like many match-3 games, this one does not reveal its character for several levels, and unfortunately people give up too soon. I used a coupon code to get this one, and I am glad I did. Yes, the art is not great, although pretty authentically ancient Egyptian, and the music quickly made me shut it off, but the game play is unusual and a lot of fun. Rated 3 out of 5 by kdubs from Perhaps best enjoyed in Zen Mode! Trial played in both modes, Timed and Zen. The good news is that you can switch back and forth between Timed and Zen via the options screen without having to restart the game. I did discover that if you lose a level in Timed, you replay the level. Not sure if a limit how many times you can fail one level before something bad happens, such as having to restart the entire game. I don't recall seeing anything that indicated if I acquired new lives as with many games. However, if I've tried 3 times and failed, I'm not above clicking options and changing to Zen so I can pass it, especially as the game progresses. lol The opening sequence certainly could have benefited from a Skip button, but at least you can click each box to fast forward through the story. The tiles are colorful, but once you get to the levels with the "twisted" tiles, I found them so covered with white mist that it slowed me down to figure out what tile was under there. Maybe just my eyes, your mileage may vary. You have to make a match with the twisted mist-covered tiles to clear them. I only saw one power-up during the trial and it clears one entire row -- unless the tile you click on is one with a design which breaks up the lines into different segments -- then it only clears that one little segment. There is space for 6 powerups total. I like the little yellow energy thingee which you click on and it clears a tiny group of tiles (3?). I think it is triggered by bigger matches. I only saw swap mode, don't know if other modes come later, but doesn't seem likely because honestly, not much in the way of bells and whistles. That said, the ability to change between Timed and Zen without having to restart the entire game is a very nice benefit in my mind. Although the tiles dropped smoothly, no tech issues during the trial, this is not a rapid fire game. If I buy it, it will be to play in Zen mode. Rated 3 out of 5 by parkersam from Wings Its another ok game, just ok I like a little more than ok from any game. Rated 2 out of 5 by rockie29 from boring As others have said this game is slow and boring which is a shame. Rated 2 out of 5 by muszka358 from Another from that firm I've got several games from that company, and graphic and story wasn't good. In fact they have these same game, three match, with these same effect. I don't reccomend. Save the world from the reawakened ancient God of chaos, Apep. His minions are quickly regaining strength and it is up to you to stop his reign.